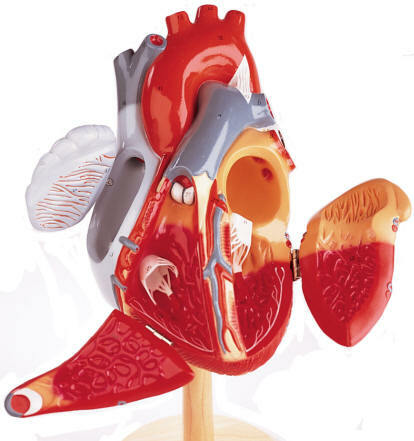 Boasting no less than 63 cardiac structures, all number coded and identified in a corresponding key, this lifelike human heart model is renowned for its anatomical detail and beauty. 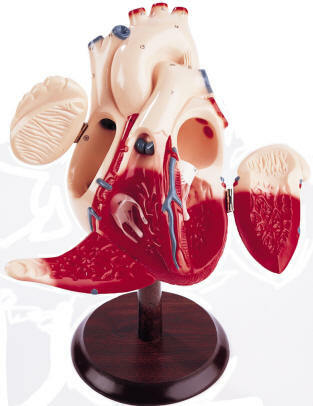 The "Heart of America" is the most widely used anatomical model of the human heart in the world. Long acclaimed by leading heart specialists and medical schools, it is twice the size of a human adult heart to show extraordinary detail and facilitate study. Three hinged portals allow full access to the heart chambers and valves. Attached portions of trachea and esophagus demonstrate their relationship to major vessels. Unbreakable vinyl models fully rotate on wooden pedestals and easily lift off for pass-around viewing. 100% American made, the authentic hand-painted detail is proudly signed and dated by its craftsman. All come with display pedestals. NOTE: These are custom hand-made models, made to order. Please allow 4 weeks for delivery. 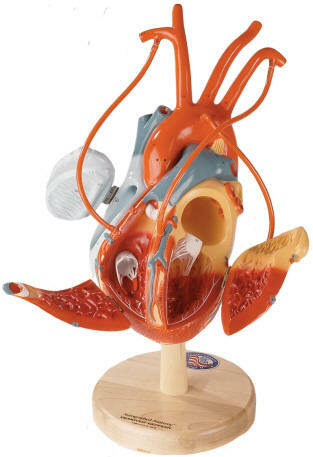 This great anatomical model of the human heart has all the exclusive features of the Original Heart of America, PLUS an accurately scaled brachiocephalic trunk, left common carotid and left subclavian artery, complete with right and left internal thoracic (internal mammary) arteries. PLUS attachable/detachable bypass vessels of flexible tubing in a variety of lengths. Simply attach tubing with built-in quick connectors to model to configure single, double, triple, LIMA or bilateral IMA bypass grafts. 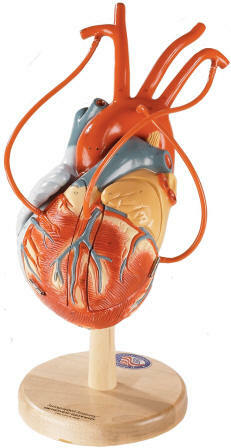 Derived from the same mold as the Original Heart of America, this more simplified reproduction of the human heart is perfect for introductory study. A 7-page study guide explains the physiological function of each of the 39 features numbered coded on the model.